Thanks to the Illinois Review for this image. 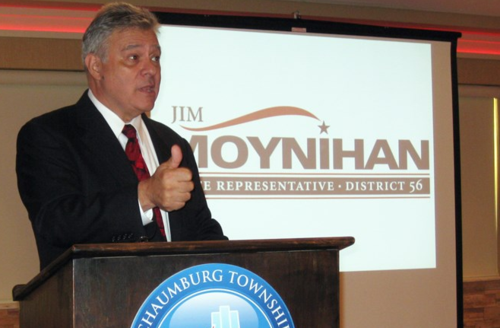 On Monday, 20 October 2014, Republican Illinois state representative candidate Jim Moynihan went to the Schaumburg Public Library to participate in early voting. When he selected his own name on the touch screen voting machine, he noticed that the selection automatically selected his Democrat opponent. Upon further inspection, he discovered that all of his other selections for Republican candidates had been changed to the Democrat opponents. “Clearly, I am concerned that citizens will be unable to vote for the candidate of their choice, especially if they are in a hurry and do not double check their ballot, … I cannot say whether or not this was intentional, but Cook County voters deserve better and should not have their right to vote suppressed. Cook County Board of Elections Deputy Communications Director Jim Scalzitti blamed the error on a calibration error and said Illinois Watchdog that the machine was taken out of service and tested. “This was a calibration error of the touch-screen on the machine. When Mr. Moynihan used the touch-screen, it improperly assigned his votes due to improper calibration. While all of this may really be due to an incorrectly calibrated touch screen voting machine, the fact that Obama’s home turf of Chicago is in Cook County, Illinois makes this very suspect.